The 41-year-old star - who has been sober since 2008 - has spoken openly about his addiction and recovery in his music and in a documentary earlier this year. Now his manager Paul told Billboard: "It was horrible. It was difficult in a lot of ways. It was sad because of his condition and we were worried about his health first and foremost. "Trying to keep everything running when you don't have a partner who is so important to the brand that you've built together and he's just not present and unable to contribute, it's just... very difficult. But we were definitely most worried about his health and wellbeing." 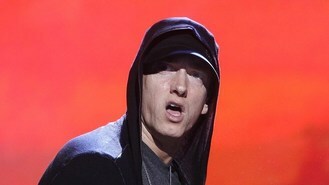 But he said that Eminem - real name Marshall Mathers - is like a different person now. Paul said: "He's five years sober, so things are a lot different. But it's not as different now as it was when he first went into recovery. "There was a time during that period where I felt like I was sort of meeting him again for the first time. He came out of this like horrible spell and he just wasn't himself. But then as I got to know him again as he is now. It's been really great." He added: "It was hard to connect with him when he wasn't present. And now [that] he's present, he's a much better partner. I think his art's a lot better and we have a lot more fun doing it. Our relationship both professionally and as friends is stronger than ever."